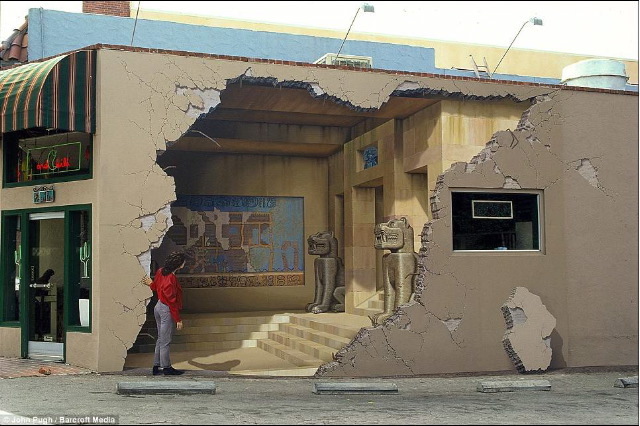 Artist John Pugh Does It Again And Again! Main Street , Los Gatos , California . 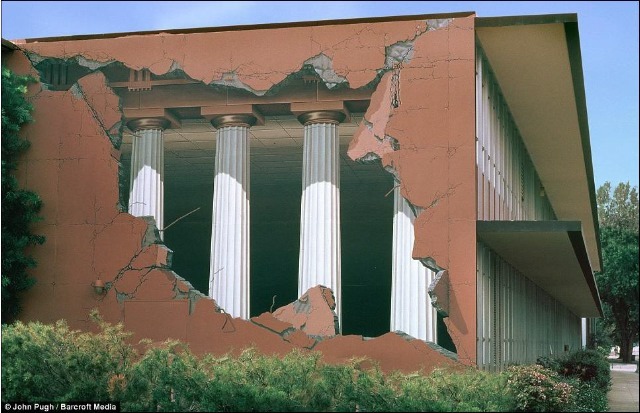 Even the woman peering into the ruin is part of the mural. 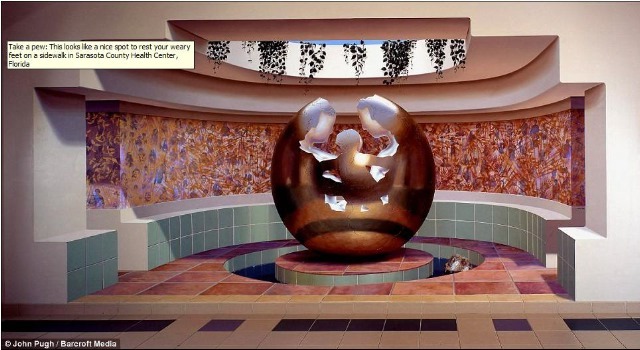 Taylor Hall, California State University , Chico , California . The Doric-style columns are actually nothing but paint. Honolulu , Hawaii . 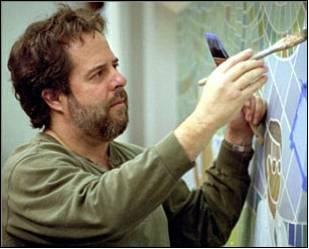 This mural took two months of studio work to plan and another six months to execute with the help of 11 other artists. 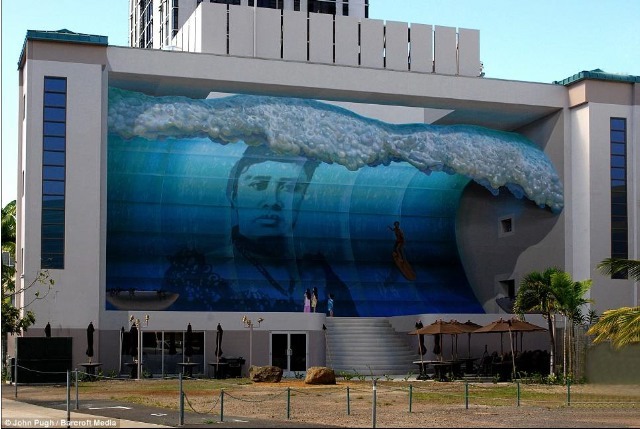 Featured are Queen Liliuokalani, the last monarch of the Hawaiian Islands ,and Duke Kahanamoku, the ultimate father of surfing. Even the stairs and of course, the sightseers, are part of the mural. Hard to believe this isn't 3-D. Check out the wave at the top. The fake skylight. Wow! 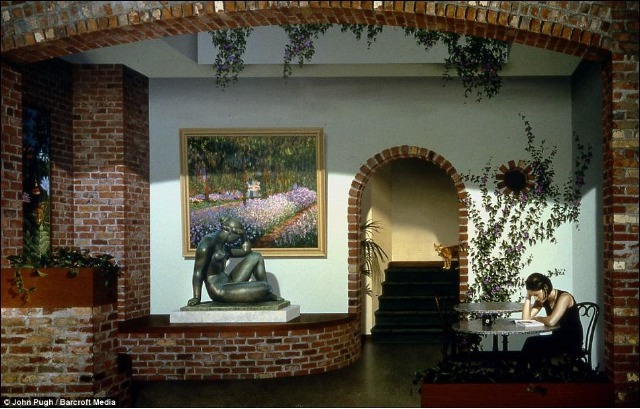 This mural at the Cafe Trompe L'oeil, San Jose , California , is entitled "Art Imitating Life Imitating Art Imitating Life. "This customer doesn't leave at closing time. And, there is no doorway or stairs to go through or climb... and the statue never needs dusting. Twenty-nine Palms, California . Valentine the bull and a patient buzzard are waiting for the artist to awake. No way... yep, way. This is all painting. Check along the base of the wall and you can see the seam between the vertical wall and the paved parking lot. How real can it get. Just outstanding. Looks like a nice spot to rest your weary feet on a sidewalk in front of the Sarasota County Health Center, Florida. Bay in a Bottle, Santa Cruz , California .. 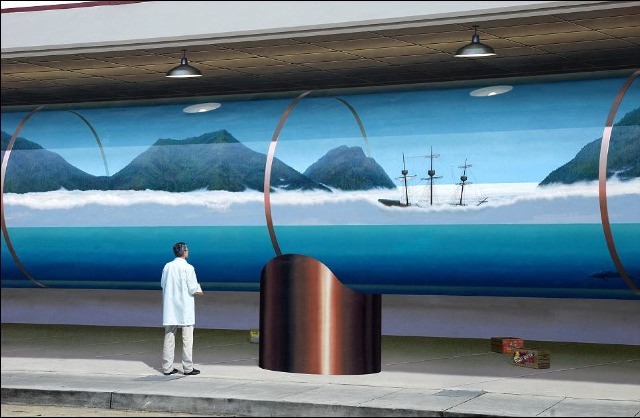 The passerby is part of the mural. 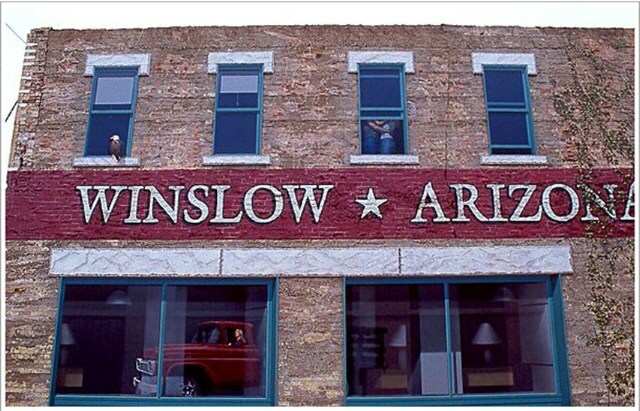 "Slowin' Down to Take a Look" in Winslow , Arizona .. Included, of course, is "a girl, my lord, in a flat bed Ford slowin' down to take a look at me." Don't you wish you did, too?